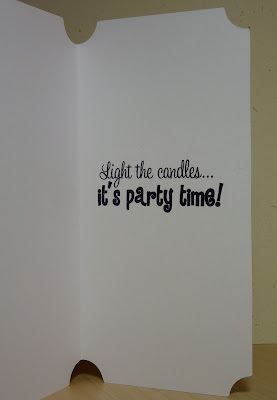 So I decided to renew my subscription to the Cricut Circle, and since I've been there since the beginning, I get a month of free access to all of the Cricut Craft Room images! The best part, since I've been focused on learning Silhouette Studio and not Cricut Craft Room, is that I can use them all on my Gypsy. I've already made a list of all of the cuts I want to make before my month is up. The margarita on this card was one of them. 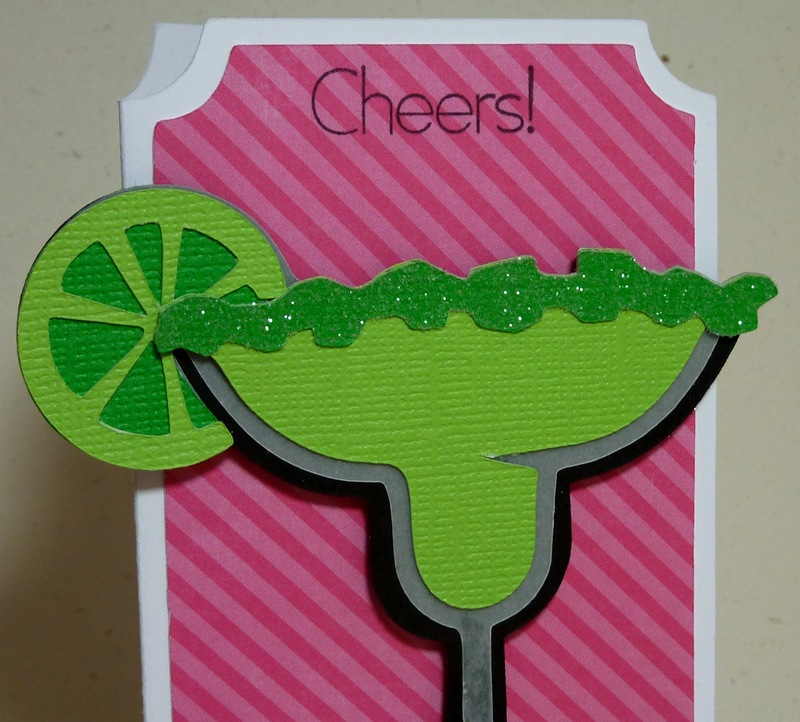 It's from the Cricut Craft Room Mixed Drinks digital cartridge. The card base is form the Cricut Art Philosophy cartridge, cut at 5 1/2". To dress up my margarita, I added a little glitter for the "salt". Unfortunately, I don't own any chunky glitter, which would have looked a lot better. I'm going to have to get on that! The "Cheers!" sentiment is from My Creative Time's Classy and Fabulous stamp set. 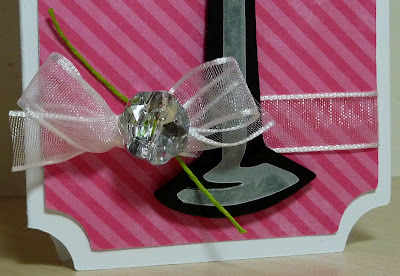 To bling it up a little, I used some lime hemp to tie a Melissa Frances clear button to an organza bow. The hemp and button are both from Liz's Paper Loft Boutique. I love those buttons! This card could be used for many occassions, but since I'm using it for a birthday, I added this cute sentiment from MCT's Celebrate Good Times stamp set. Kaite ~ It maybe 9 am ~ my time but CHEER to you too! LOL! Alright you are certainly using this time to your advantage! I LOVE that cut!!! The color combination is so FUN and PERFECT for this cut!!! Oh I LOVE that glass button! Dang I should have picked that up!!! Reminds me of a charm you put around a glass at a party so you know it is yours ! CLEVER!! Oh my you used glitter for the salt ~ LOVE it ~ and WOW hope it wasn't to messy for you!!! LOL! AWESOME card!!! This is AWESOME!! Looks delish! nice card, it makes me want to sit on the beach with my sunglasses and the drink in my hand, watching the waves roll in!! 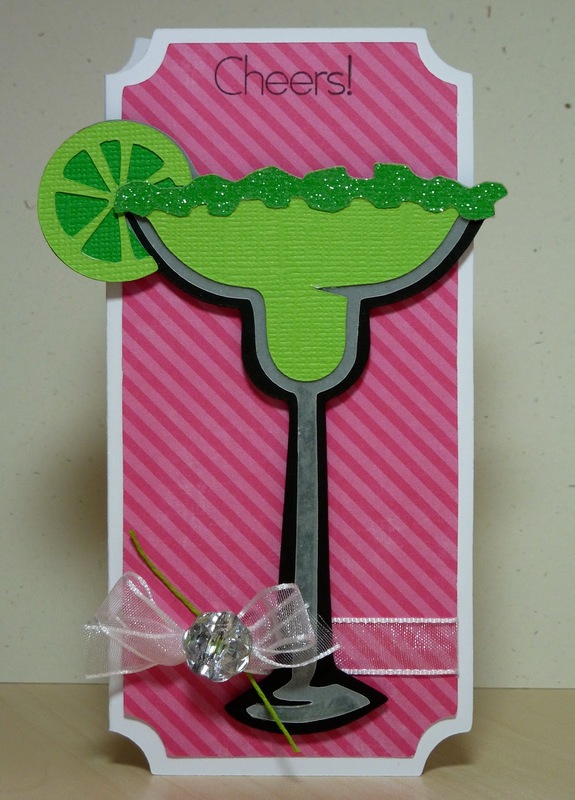 I can almost taste the lime :D I love the salt glitter and the button and ribbon are a perfect bling balance. Great job!